A re-release of the old SPI title, this update has improved graphics, a larger hex grid on a larger map and larger counters. The following post looks at the mechanics of this easy access game. Note this version looks to have been printed in 2013. Using the Panzergruppe Guderian system, this game definitely belongs to the 'oldie but goodie' class and the reprint has allowed me to bring it back into my collection. It retains a relatively small footprint and this together with fast play, makes it more suitable to my current gaming needs than when I first owned (and sold) it. 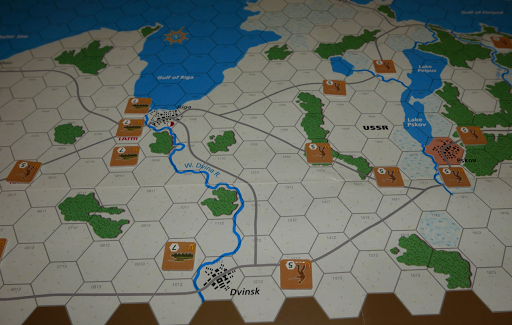 (Above - opening Soviet positions) The game scale is set at twelve weekly turns and 20 miles to the hex. The context of the campaign is that the game covers the opening advance of Army Group North and the drive on Leningrad. I am pretty sure that this time around, the map has increased from a 2 to 4 panel affair, resulting in the much appreciated bigger hexes and a larger offset display that shows Leningrad and the six adjacent hexes blown up to a supersize, so that counters can be transferred there once the inevitable siege (the German player hopes!) 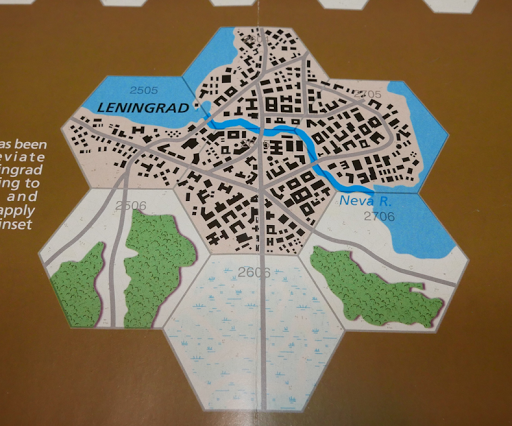 of Leningrad starts to cause stacking problems on the main map area, though the larger hexes make this much less of an issue than in the original game. 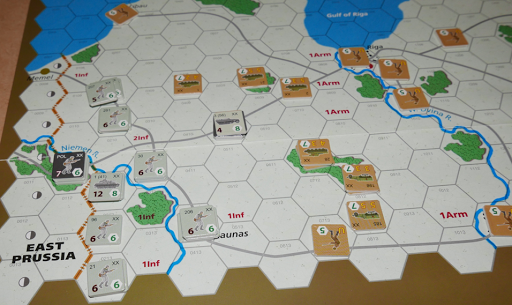 (Above - the enlarged play aid on the map to help stacking congestion at Leningrad) German units are starting the game in East Prussia and set-up causes them to stack at 3 units per hex, allowing them to get straight into efficient overruns on the opening turn. The German player needs to quickly penetrate into the map to pocket and destroy significant numbers of the enemy if they are to maintain the pace that they need in order to reach and attack into Leningrad. On turn one, the Germans will try to pocket all of the 'at front' Soviet forces, then in the Soviet part of the turn, Soviet forces are obliged to make contact and counter-attack, usually a costly affair as they throw themselves on the Germans, and so by the end of turn one, a heavy toll has usually been taken on the Soviet army. 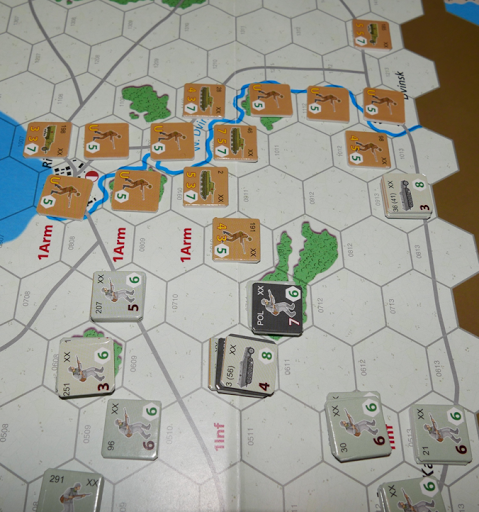 (Above - the Turn Track, note all Soviet reinforcements are face down) The middle part of the game has the Soviets trying to defend along the Dvina River and then falling back into the marshy difficult terrain that protects all the routes to Leningrad. If the Germans have been able to maintain an effective advance, then the final part of the game should see the fight for Leningrad and this is where the big victory points are for the German player. The game employs my favourite game mechanic ...... Untried Units. This means that all Soviet forces are a single step and they always start or enter the game face down with their rear side only showing unit type and movement allowance, so that neither player knows the actual strength of the unit(s) until after an attack has been declared. It makes for a general uncertainty, delivers some specific surprises and substantially adds to the enjoyment for any players doing a solo game. 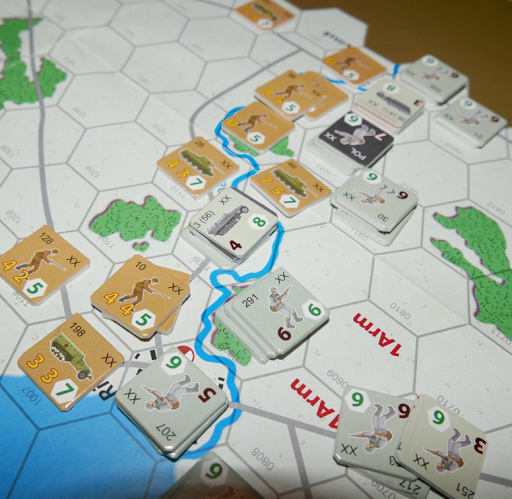 (Above - on turn 1, the rear Soviet units will move to defend the Dvina River) The Combat table uses odds ratio's with column shifts for modifiers and runs off a singe D6. Armour gets a bonus when present in the combat and fighting for open terrain, even when an attack is made across a river. The Germans have two Panzer Corps (a third arrives late in the game as a reinforcement) and providing all elements of the corps are stacked together, they will get a combat bonus for unit integrity, so these stacks are often getting two column shifts in combat for the corps and the armour bonus, easing their task of maintaining the advance. Combat results are given as no effect or 1 loss or 2 losses. A loss can be absorbed as a step loss or by retreating and this brings in some nice local nuances. 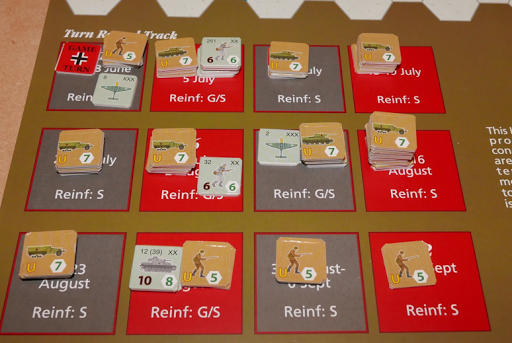 The Germans can recover some of their losses to onboard units (not the dead pile), but each one must occur in a city, the unit must be unused for a full turn and it costs them 1 victory point. However, this is useful in both maintaining German strengths and not giving bigger victory points to the Soviet player by the absolute loss of units in the game by their removal from play. Supply is important and easily applied, with the supply chain being 5 movement points to a road or supply source and if the former, then the road must be in supply all the way back to a supply source. Supply is calculated at the start of a units movement phase and at the start of any combat. On turn 1, the Germans get an attack advantage of lower cost overruns and on turn 8 the Soviets get a big advantage of a four column shift to the right for any attack. Though this is potentially quite fearsome, the reality is that by turn 8, the Soviet player may need to be thinking more about preserving forces and improving a stretched defence rather than going over to the attack. The Germans do get one air unit at the start of play and another later as a reinforcement. This can be added into any attack or defence to get a favourable column shift or the player has the option of deploying it in an interdiction role, in which it doubles the movement cost of a hex for movement and supply purposes. Finally, disengagement rules bring a nice touch to the game. 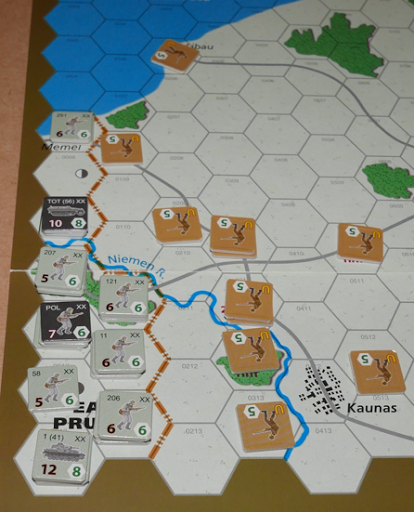 Units can disengage from an enemy Zone of Control, by paying a movement penalty, but they cannot move directly to another ZOC and of significance ..... they cannot disengage unless at least one other friendly unit remains in the enemy ZOC, so these semi-sticky ZOC's can create havoc for a Soviet player trying to pull back to better positions or trying to avoid being surrounded. Last time we played, the Soviets won the game, mainly by just bogging down the German advance, so that they ran out of time to properly besiege Leningrad. With this re-match, will any lessons from last weeks game, influence either of us? (Above - the Germans set-up in East Prussia) The German initial attack was well thought out and from a number of overruns and cutting enemy supply, the whole of the Soviet front was pocketed and destroyed. However in doing that, the German player made a notable miscalculation .... they allowed 56th Panzer Corps to drive too deeply into Soviet territory and end up isolated. In the Soviet part of turn 1, they are forced to counter-attack and to engage wherever possible. This can often see the demise of another batch of Soviet units as they engage along the German line at disadvantage in combat odds, however, the forward position of 56th Panzer Corps allowed the Soviets to concentrated their units around this formation, cut its supply and attack with odds that at least would not cause the attackers any harm. The result being that although the German Corps came out of it with just one loss, the attackers were then able to convert their loss into a retreat (i.e. in effect disengage), a good result with minimal loss. (Above - 56th Panzer Corps' deep advance) The Soviet reinforcements are drawn blindly, so that neither side knows their strength (untried units) and it just so happened that their turn 1 reinforcements in the south were particularly strong and so likewise, they survived their contact at the southern end of the battlefield, turning their losses into a retreat. These surviving Soviet units, together with at start units that had been racing towards the front line, congregated around the Dvina River. While this looked a particularly formidable defensive line, the stand of such a large portion of the Soviet army along this river line would prove to be the Soviet players greatest mistake, as it simply gave the Germans a lot of opportunity in the following couple of turns to destroy large forces, that would have been better to have been deployed as speed bumps at choke points on the drive to Leningrad. (Above - Soviet forces concentrate at the Dvina River) Despite thickening the defences of crucial supply routes, the Germans overran these defences and as they fanned out beyond the Dvina, individual Soviet units were unable to disengage and so were easily surrounded and destroyed. (Above - 56th Panzer Corps breach the defences at the river) As we entered the mid game, the Germans were approaching the bad terrain that covers all three roads to Leningrad. Although through the clever use of choke points, this was ideal terrain to make the Germans spend turns fighting for every hex, it was in fact a struggle for the Soviets to get reinforcements into those important positions and those that did, were too weak to offer an effective defence. Also pushing these units forward was done at the expense of manning the circle of forts around Leningrad or indeed Leningrad itself, for the inevitable battle that would shortly follow. (Above - a thin screen blocks the reman advance, note the lack of troops to the rear) Pskov quickly fell and the Soviets around Tallinn became isolated and within a turn, the Germans were threatening Leningrad from the northern road, a route that would later also ensure that their supply line to the fighting around Leningrad would be secured to the end of the game. On turn 8, the first German units arrived on the outskirts of Leningrad. Turn 8 (fixed schedule) also sees the arrival of Soviet reinforcements from the east, that on that turn get a four column shift in their attack capability, but the German advance had been so rapid, that these forces could only really do some local damage and importantly, their way was blocked to reaching Leningrad and assisting in manning either the forts or the city. As time rumbled on, they would prove to be no more than a thorn in the side of the German effort and within a couple of turns, they had mostly been destroyed. 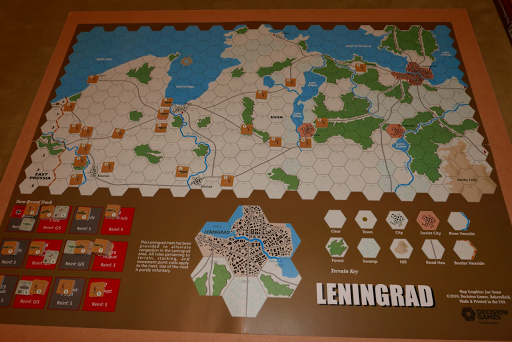 On turn 9, 41st Panzer Corps entered the first of the four city hexes that form Leningrad (worth 30 victory points). The Soviet decision to abandon this hex had been difficult, they had received a 'two hit' result. They had three units in the hex and could have stayed by taking two losses and leaving one unit in place, but the player believed that they could not reinforce the hex adequately in the following turn, so retreating the three units instead of taking hits and preserving them was the preferred option. This position of course gave the Germans massive leverage against the other frontline Leningrad hex and that, not surprisingly, quickly fell. 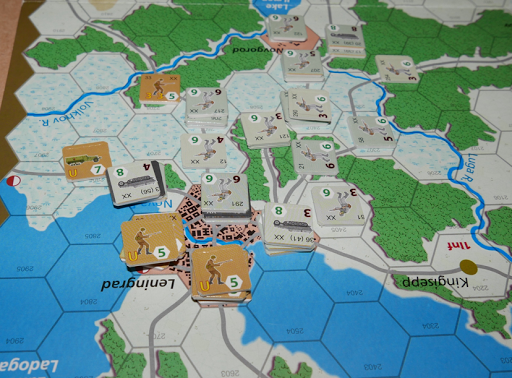 (Above - two hexes of Leningrad have fallen) This second hex had become isolated, so units could not be fed into there, however, had the Soviets managed to hold for another turn, then the reinforcements that arrive in the last few turns can be placed directly in any Leningrad hex and so this hex may have been able to hold out through to the end of play - who knows! Anyway, Leningrad being two hexes down, gave the Germans a massive 60 victory points (Strategic Victory). As we played into the last turns, the Germans could not get deeper into Leningrad, but neither could the Soviets re-take the lost ground. Had the Soviets earlier been able to employ a better delaying strategy (by not defending so heavily along the Dvina) and perhaps then gaining a one turn delay in German advances, it is plausible that Leningrad could have been saved, or at least reduced their loss to just one city hex - it is hard to say, but the fact that the situation put this prospect in the mind of the Soviet player (despite their losses and dire position), shows how well balanced this game is. Conclusion. I have appreciated not only the re-publication of the title but that the opportunity was taken to make play easier to manage by increasing hex and counter size. Taking everything together, this package will hit the mark for many of the readers of this blog, in that it is small and portable, with easy rules, but enough nuances and tactical decisions to keep both players fully engaged throughout. Also each army requires different handling, which also adds something to the game and to replayability. Complexity - The box gives this a 1 out of 5 score (I would rate it a bit higher at 3 out of 10 to catch all the subtle rules). At just 4 pages of easy read text, this is something of a classic ruleset with few exception type rules. In our first game, we probably forgot a couple of tucked away rules, but in our second game, we were almost certainly playing with a full grasp of the rules and the rule book mostly stayed in the box. Time - The box says 1 - 2 hours, but we have found that an enjoyable game has needed around two and a half hours. 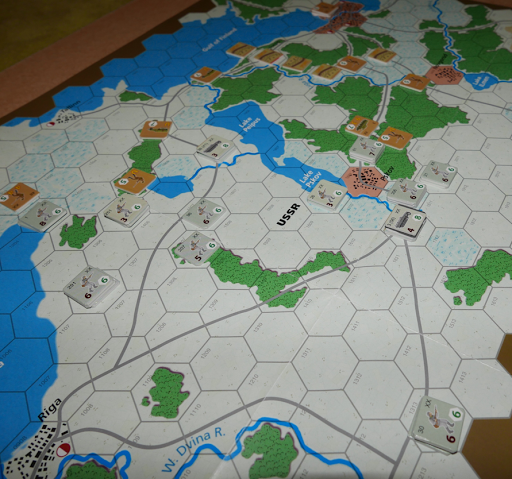 The main game time will be with the German player, as their army remains largely intact and has plenty to do, while the Soviet options to do much other than manage good choke points reduces as the game progresses, so game playing time is largely reliant on the nature of the German players style of play. Space - As a half mapper (11" X 17") with a relatively low counter density, the game is ideal for the space strapped gamer. All play aids are printed on the map or in the rulebook, so additional space is not needed. The box is a slim, so takes up minimum room on the shelf and being very sturdy would make for a good vacation game. Solitaire - This is a two player game that does not have any mechanics that would cause a solo gamer any problems. Indeed the 'Untried Units' rule enhances solitaire play. 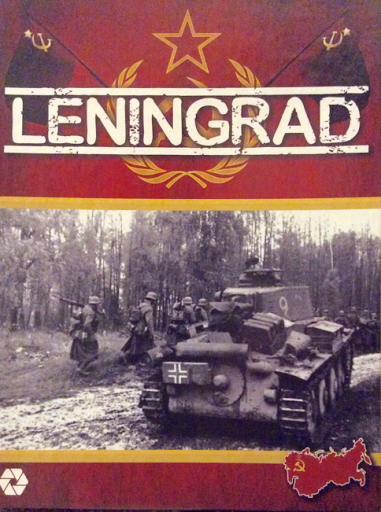 Good work on a review and replay of Leningrad. I am not familiar with this series but may be worth a look. Not any time soon though as I have a PILE of hex and counter games begging to be pulled down off the shelf. A number of new ones have made it in house recently too. So many toys, so little time! I like the "untried unit" mechanism, myself. Remember the "Seeing the Elephant" rule from SPI/TSR/S&T/SDI/GMT GBACW series? One never really knew what the morale grade of troops first seeing battle would be. As for the components, themselves, I prefer operational/strategic games to have depictions other than those iconic profiles. NATO symbols work better for me. Low counter density is a big plus in my book. Always enjoy your detailed reviews and replays, Norm! It has been a while since you made a post. It was worth the wait. A thoroughly enjoyable review and game write up. Brilliant AAR of our second game of Leningrad. Norman very kindly played the Russians both times, giving me the lion's share of the excitement. As a result had an excellent gaming session. Playing solo would be a great experience. The reissue makes a huge difference to the quality of play, because of the increased hex size and counters. Thanks gents, I think the game deserves showcasing. Mike, glad you enjoyed the game, I can see this gracing the table again at some point ....... it has whet my appetite for an early go at the new edition of Defiant Russia by Avalanche Press. Thanks David, I hope it meets your expectations. Another game using a very similar system (~6 pages of rules) should come out in a year or two. I was a playtester on this project and enjoyed all six of my plays. The easy to play games with a 2 to 4 hour playing time have become a larger segment of my purchases in the past two years so I am glad you often review games in that segment. That is interesting, something to look forward to. My own buying has become much more selective these days and in the main, I am looking for playability and single session games.